The Ilankai Thamil Arasu Katchi (ITAK) was formed in 1949 by a dissident faction of the All Ceylon Tamil Congress (ACTC) led by well –known lawyer G.G. Ponnambalam. The new party was called the Federal party in English though its name in Tamil stood for “Ceylon Tamil State Party”. The break away group was led by two Lawyer Parliamentarians and a Medical Doctor Senator. The two MP’s were SJV Chelvanayagam and C. Vanniasingham representing Kankesanthurai and Kopay electorates respectively. The Senator was Dr. EMV Naganathan who later became MP for Nallur. 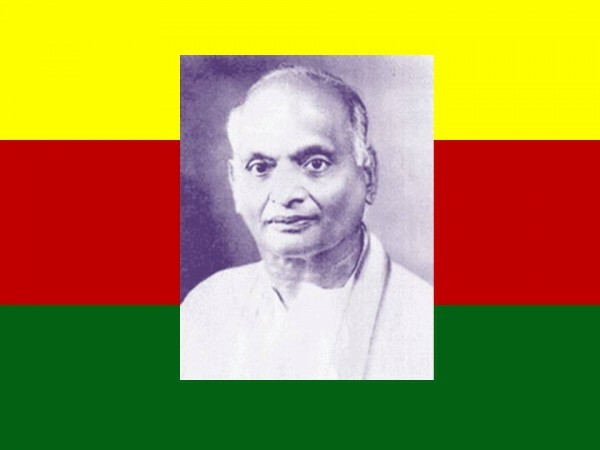 Dr. EMV Naganathan was a vibrant colourful personality who dominated Tamil politics for nearly two decades.Having been involved in a limited sense with the Spanish civil war, the Irish campaign for Independence and the Indian Freedom struggle during the days of his youth ,this pugnacious medical practitioner fought in the vanguard of the non – violent struggle for Tamil rights in his own country in later years.Like Sardar Vallabhai Patel of India, Dr.Naganathan too was called “Iron man”or “Irumbu Manithan” those days. This was both due to his pugilistic attributes and the role he played as strong man of the party. There are many tales about the exploits of the legendary Iron man.In 1956 when the party was engaged in Satyagraha at Galle Face Green protesting Sinhala being made the Sole Official Language, a mob was unleashed on the peaceful Satyagrahis while the Police did nothing.Naganathan was manhandled ,stripped of his “Verti” and dumped in the Beira lake by the cowardly goons who were utterly ignorant about the principle of non – violent protest. The Doctor underwent the violence like a True Satyagrahi without retaliating.However when four thugs accosted him later – after the Satyagraha had ended – Naganathan reportedly hit back with his fists in self –defence and chased the four assailants away. Another incident occurred opposite the Jaffna Kachcheri when the ITAK was conducting Satyagraha in 1961. In a bid to break up the Satyagraha the Police brutally baton charged the peaceful protesters. After warding off blows for a while Dr. Naganathan reportedly snatched the baton and broke it into two thereby demonstrating that he was indeed an Iron man.After weeks of non –violent protest resulting in the paralysis of administration in the North and East , the Army was called in to disrupt the Satyagraha. Federal Party leaders were arrested. Nallur MP Naganathan along with Kopay MP Balasundaram evaded arrest for a while and finally turned themselves in voluntarily and were placed under house arrest at the Panagoda army cantonment. The ITAK was quite pro-active in those days of non – violent political struggle. The party launched many demonstrations and political campaigns . Dr. EMV Naganathan summed up this political approach by famously saying “The ITAK Must Always be on the Attack” and “The ITAK must Maintain its ATTACK”.These popular sayings by Naganathan about the ITAK being on the Attack comes to mind in the present situation concerning the party. The difference nowadays is that instead of being on the Attack , it is the ITAK that is being constantly under attack. Instead of being politically proactive the ITAK is compelled to be reactive when subjected to these attacks. The unkindest cut of all is that the bulk of these political attacks are from within.The political attacks against party leaders are emanating from elements inside the ITAK and Tamil National Alliance(TNA) as well as outside antagonists.The latest round of anti –ITAK attacks is the campaign against TNA leader Sampanthan and national list MP Sumanthiran on which this writer focused upon in these columns last week. In writing last week about the attacks on the duo in general and Sumanthiran in particular this writer made the following observations- “The revolt against Sampanthan’s leadership and the revulsion displayed towards Sumanthiran is an orchestrated illusion. Though the “Tamil Net” and other tiger and pro-tiger media organs try hard to project an impression that the Tamil people are up in arms against Sampanthan and Sumanthiran, that is not so”. This Writer also opined that “The protests and incidents of arson do not in any way reflect the thinking of the Tamil people in general. The important thing for Sampanthan and Sumanthiran is not to cave into this pressure. It is also imperative that saner elements within the TNA close ranks and back the duo strongly in resisting such pressure”. It was also pointed out in these columns last week that “The London antics by the pseudo-nationalists can be dismissed as the work of the Tamil lunatic fringe but the role played by TNA elements in attacking Sampanthan and Sumanthiran in Sri Lanka cannot be ignored. The central committee of the Ilankai Thamil Arasu Katchi (ITAK) which is the chief constituent of the TNA will be meeting in Vavuniya on Sunday March 1st. It is very likely that the issues will be taken up for detailed discussion and necessary follow up action”. 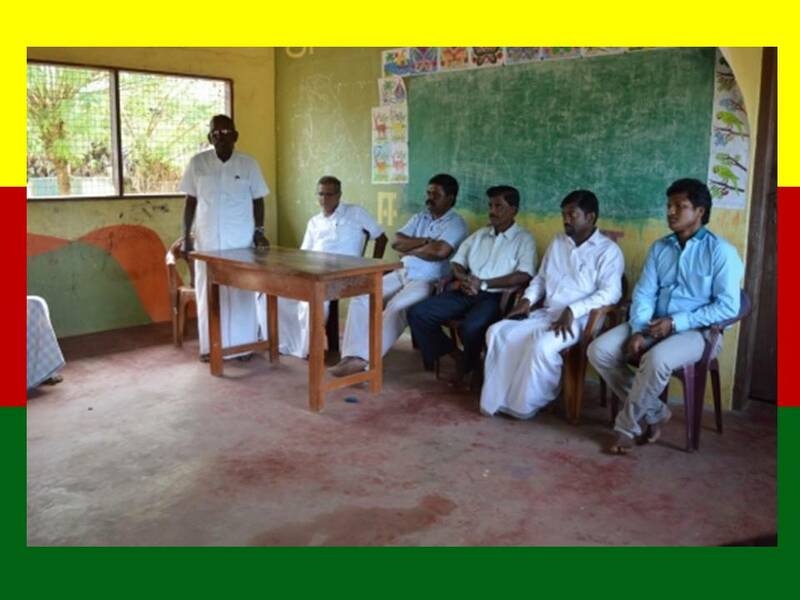 It was against this backdrop that the “Mathiya Seyal Kuzhu” or Central working Committee of the Ilankai Thamil Arasu Katchi met at the Guest House in Kurumankaadu in Vavuniya on Sunday March 1st. The ITAK is the chief constituent of the five party configuration known as the Tamil national alliance.The bulk of TNA parliamentarians, Provincial councillors and local authority representatives are from the ITAK. The TNA contests elections under the house symbol of the ITAK. 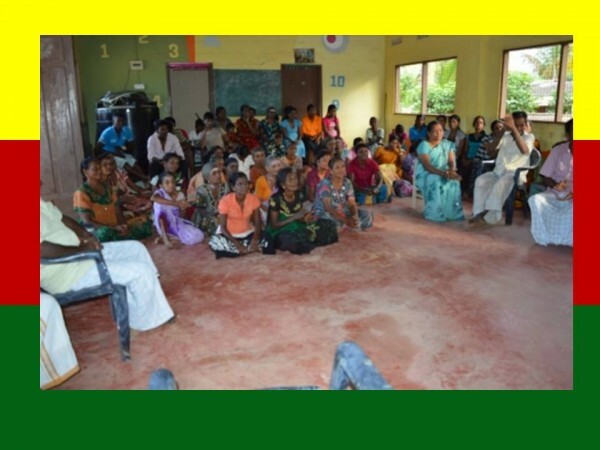 Forty-four members of the Fifty –member ITAK central working committee were present at the meeting chaired by the septuagenarian ITAK President Somasundaram Senathirajah who is also the secretary of the TNA. The senior Jaffna district MP is known generally as “Maavai” which is a short name in chaste Tamil for Maaviddapuram the village which Senathirajah hails from. Initially the mood was sombre and tensed as much intra-party strife was anticipated on account of the effigy burning controversy.Tiger and pro-tiger media had played up the attacks on Sampanthan and Sumanthiran as being illustrations of widespread discontent and resentment within party folds. Therefore some felt that there may be intrusions by conspiratorial forces to disrupt proceedings or engage in political stunts. Complicating matters further was the knowledge that a group of Diaspora supporters of the Liberation Tigers of Tamil Eelam (LTTE) had arrived in the country from Europe.This group with ample funds at their disposal have a specific agenda. This was to “finance “ various individuals and organizations into fomenting demonstrations and engaging in disruptive activities.Apparently tigerish hardliners in the Diaspora want to cause disunity within TNA ranks and undermine the Tamil leadership. They want to pressure Sampanthan into retiring from politics and intimidate Sumanthiran into quitting politics.There is also a broader objective of poisoning relations between the Tamils and Sinhalese at one level and alienating Tamils from India at another level. Many of the recent developments in the Tamil political sphere have to be viewed in this light. These Diaspora elements who were earlier apprehensive of entering Sri Lanka are now emboldened to do so after the exit of Gotabhaya Rajapaksa. Thus when the ITAK working committee meeting began there was much tension and anxiety about potential external intrusions and internal conflagrations.Happily these “fears” became “liars” as events unfolded. “Maavai” Senathirajah started the ball rolling by delivering a forceful speech critical of the attacks and those responsible.There had been some doubts within party ranks earlier about the stance of Senathirajah. Some suspected that he was backing and encouraging the dissident elements. Senathirajah’s perceived closeness to people such as Jaffna University emeritus Professor Sittampalam was well known. It was also Senathirajah who brought the unruly maverick MK Sivajilingam back into the TNA and gave party nomination to Ananthy Sasitharan. Senathirajah however laid to rest these doubts and effectively demonstrated his loyalty to Sampanthan and affinity to Sumanthiran by his preliminary remarks. He castigated those responsible for the attacks in the strongest terms causing much discomfiture to a squirming Prof. Sittampalam. The burning of Sumanthiran’s effigy in Jaffna by TNA sections was severely condemned.”Maavai” Senathirajah revealed that he had wanted to issue a condemnatory statement when the effigy was burnt but Sampanthan had advised him to wait until the working committee meeting was held and let the party take collective action. Thereafter working committee members started speaking one after the other. The representatives from the Eastern province and the Wanni were vehemently critical of the attacks. TNA personalities such as Ananthy Sasitharan, Sivajilingam and Suresh Premachandran were severely condemned.They expressed their support and solidarity for Sampanthan and Sumanthiran while the duo maintained dignified silence. If there were any misgivings about party unity over the issue such impressions were proved totally wrong. Some criticism was also levelled against Northern chief minister CV Wigneswaran and NPC chairman CVK Sivagnanam.It was pinpointed that when provincial Fisheries minister Balasubramaniam Deneeswaran presented a resolution in the council condemning the burning of Sumanthiran’s effigy the majority of councillors had wanted to endorse it. Chief minister Wigneswaran had not expressed support for the resolution and had maintained a deafening silence when the controversy erupted. Sivagnanam who was presiding instead of putting the resolution to vote had ordered an end to the discussion saying that he condemns the incident. An emphatic speech was made by Jaffna district MP and newspaper proprietor E. Saravanabavaan who disclosed the names of the people responsible for the effigy burning.He revealed that the exercise was undertaken by aides of Ananthy Sasitharan the Northern provincial councillor. Sumanthiran’s effigy was transported in Ananthy’s vehicle by the ringleader Kandasamy Sathees who is the former deputy chairman of the now dissolved Valvettithurai urban council. Sathees, earlier a lackey of former MP Sivajilingam is now an acolyte of Ananthy Sasitharan who is being promoted by a section of tiger elements as the supreme leader of the Tamils. Saravanabavaan also pitched into Prof. Sittampalam for telling the BBC Tamil service that a disciplinary inquiry would be launched against Sampanthan and Sumanthiran for attending the Independence day event.The academic was also reprimanded for participating in the effigy burning. This was echoed by many in the gathering. Sittampalam cut a pathetic figure as he tried to defend himself by saying he had only participated in the protest demonstration and had had nothing to do with the effigy burning. The emeritus professor who is the senior vice president of the ITAK was expected to spearhead the revolt against Sampanthan’s leadership on that day. Sittampalam’s isolation at the meeting indicated clearly that Sampanthan the veteran politician from Trincomalee had won the day. Sampanthan then asked Sumanthiran to make a detailed presentation to the working committee about the current political situation with particular reference to the probe being conducted by the office of the UN Human Rights Commissioner. Sumanthiran the ITAK deputy general secretary in charge of legal and constitutional affairs had been interacting n behalf of the TNA with the main players involved in the exercise including UN Human Rights chief Prince Zeid Ra’ad Zeid Al-Hussain. Sumanthiran had been singled out as a target by LTTE and pro-LTTE elements in Sri Lanka and abroad as being responsible for the postponement of the report from March to September 2015. He was also criticized for allegedly trying to substitute a domestic investigation in place of an international inquiry. The lawyer MP made good use of the opportunity by explaining in detail the chronology of events pertaining to the issue. He also re-iterated that he too opposed the delay in the release of the report but was trying to utilise the delay constructively. Elaborating further Sumanthiran convinced the gathering that neither he nor the TNA hierarchy were acting contrary to Tamil interests and persuaded the working committee that the course adopted by the TNA currently was the best under the circumstances. Sumanthiran also exposed vividly the puerile positions taken over this issue by his critics such as Ananthy Sasitharan of the TNA and Gajendrakumar Ponnambalam of the TNPF/ACTC. According to TNA circles the central working committee had erupted into thunderous applause after Sumanthiran’s presentation. 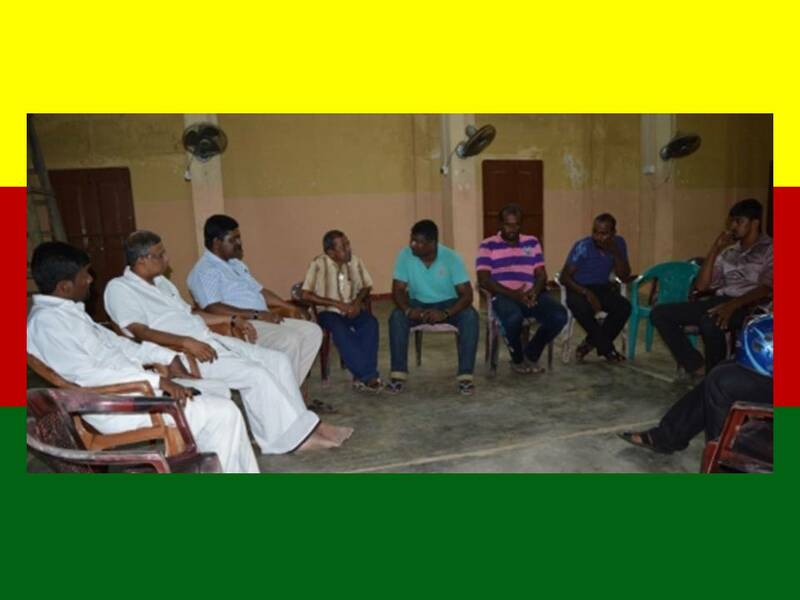 Members said that they were now very clear on the subject and firmly endorsed the stance adopted by the party leadership.Several working committee members had wanted Sumanthiran to visit their areas in due course and explain matters to party cadres at grassroot level. Sampantan then intervened and proposed that Sumanthiran should write up his presentation in the form of an article and release it to the media. Copies could also be distributed to party members and disseminated via Internet. This was agreed upon.It was also suggested that Sumanthiran go around the north and east and conduct discussions with the people and explain matters. Sumanthiran agreed to do so. – Take steps in respect of the disappeared. “Further, we urge the government to resettle, in their own lands, those displaced by the war. Moreover, the Central Committee reiterates that the government must, without delay, commence appropriate measures in respect of an acceptable political solution to the ethnic conflict”. “The Central Working Committee today endorses and accepts the steps taken by the leadership of the Tamil National Alliance in the changed political environment prevailing after the change of regime in Sri Lanka”. The second resolution was proposed by former Batticaloa district MP and current Eastern Provincial councillor K. Thurairajasingham who is also a lawyer by profession. The resolution submitted by Thurairajasingham – now the Provincial minister of Agriculture- related to the recent attacks on Sampanthan and Sumanthiran. “The Central Working Committee of the ITAK continues to observe the unwarranted and unacceptable steps being taken against its Senior Leader R. Sampanthan and Deputy General Secretary for International Affairs and ITAK Spokesman M. A. Sumanthiran in recent times within the Tamil homeland and in the diaspora”. c) The collusion of TNA leaders in the above activities has brought into question the unity of the Tamil National Alliance. “It is of regret that Ms Ananthi Sasitharan transported the particular effigy to the location of the protest in her vehicle. It raises the question of her accountability to party discipline. The fact that the two individuals in question – Mr. Premachandran and Ms Ananthi Sasitharan – did not express regret over the incident suggests their willing involvement in it”. “Further, Mr. Suresh Premachandran MP, has continued to criticize Mr Sampanthan and Mr Sumanthiran on many occasions. The Central Working Committee condemns these actions by Mr. Premachandran. This Committee must take disciplinary action against Ms. Ananthi Sasitharan who is herself a member. Mr. Premachandran has also acted irresponsibly in exercising the duties entrusted to him as Spokesman by the Parliamentary Group of the TNA. In this regard, the Central Committee calls on ITAK Members of Parliament to take action in respect of the abuse of his responsibilities”. “The Central Working Committee also strongly condemns the burning of Mr. Sampanthan and Mr. Sumanthiran’s pictures outside the residence of the Prime Minister of the United Kingdom and in front of the American Embassy in London, during protests conducted by some members of the diaspora to seek support for a genocide inquiry against Sri Lanka. Moreover, the Central Working Committee condemns the actions of the former Deputy Chairman of the Valvettithurai Urban Council Sathees who set fire to the effigy of Mr. Sumanthiran in Jaffna”. 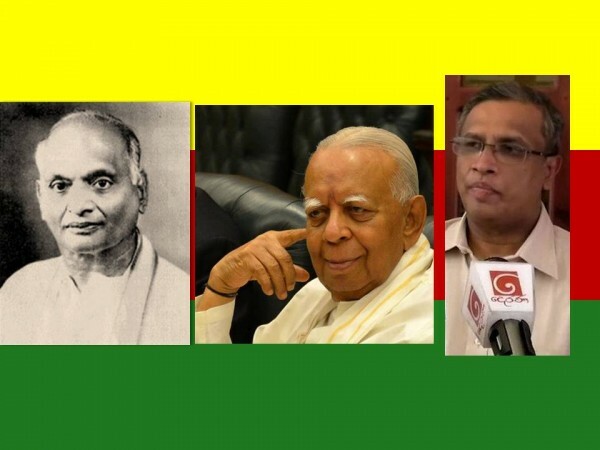 The outcome of the ITAK central working committee proved conclusively that the party was firmly behind the Sampanthan-Sumanthiran duo . Though tiger and pro-tiger media organs projected an image of great turbulence within the TNA the anticipated crisis turned out to be a “tea cup tempest”.Despite overseas media organs portraying an impression of the Tamil people being against Sampanthan and Sumanthiran the reality that prevailed was virtually the opposite of this optical illusion. There was no public outcry against the resolutions in any way as Diaspora elements hoped for. 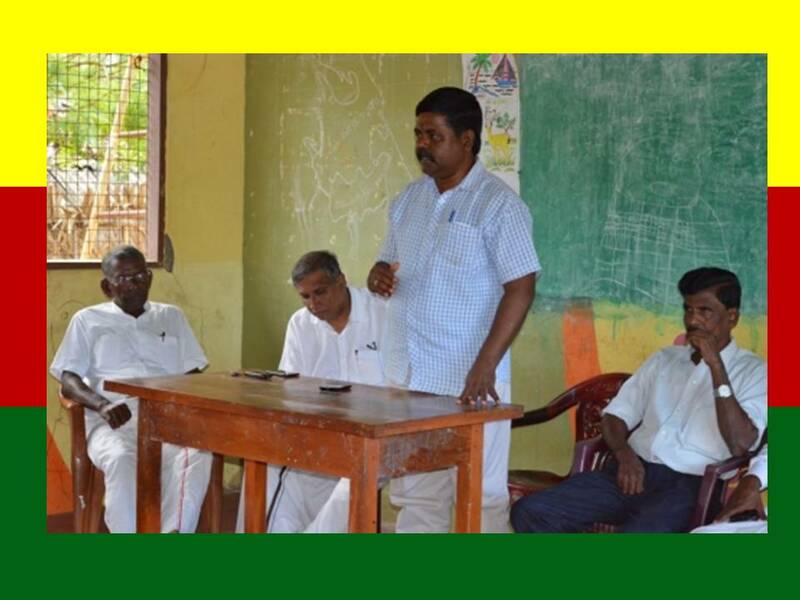 The ITAK resolutions given wide publicity in the mainstream media had specifically mentioned the names of Jaffna district MP Suresh Premachandran, Northern provincial councillor Ananthy Sasitharan and Ex – Valvettithurai Urban council deputy chairman Kandasamy Sathees. Premachandran along with Sumanthiran participated in the Northern Province Coordinating meeting chaired by President Maithripala Sirisena himself.Both TNA parliamentarians were seen to be immersed in amiable conversation with each other. Following the suggestion made at the ITAK working committee meeting Sumanthiran embarked on a program to hold discussions with the people and explain the current political situation relating to the UN probe.An open discussion was arranged to be held near the Point Pedro Sivan temple on March 4th. Jaffna district MP Sivagnanam Sreetharan and MA Sumanthiran MP were scheduled to address it. The pro-tiger extremists within TNA ranks were apparently fuming after the ITAK working committee meeting which strongly backed Sampanthan and Sumanthiran. Valvettithurai (VVT) Urban council ex-deputy chairman Kandasamy Sathees was angry because his name had been specifically mentioned in the resolution as being responsible for burning Sumanthiran’s effigy. Fuelled perhaps by funds from the Diaspora group in the country with the objective of humiliating and intimidating Sumanthiran into giving up politics, Sathees planned a pre-dawn “operation” against the TNA national list MP. Sathees with more than a dozen of his cronies started out from VVT in the early hours of the morning in five vehicles. They were all supposedly members of a new youth outfil recently floated with Diaspora funds. It is named “Eezhath Thamizhar Illaingar Peravai”(ETIP) meaning Eelam Tamil Youth Federation.The ETIP convoy proceeded along the Vadamaratchy coast and reached Point Pedro. 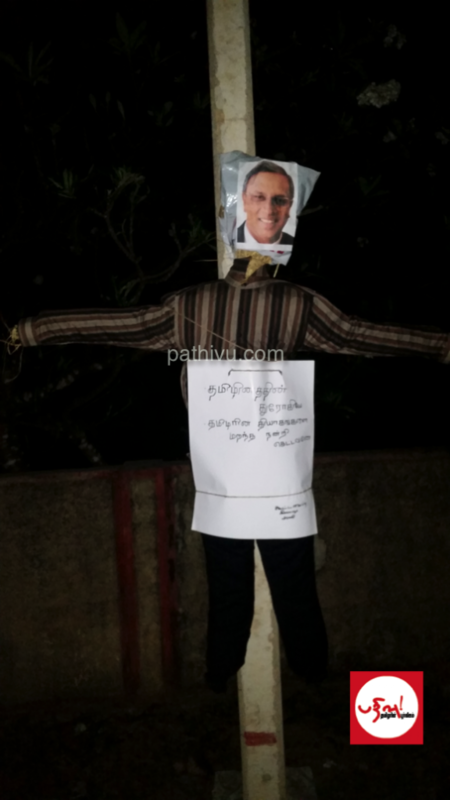 An effigy of Sumanthiran with placards dubbing him “thurogi” or traitor was hung up close to the Sivan Temple premises where Sumanthiran was scheduled to speak that evening. Sathees and his gang then went down the Jaffna –Point Pedro road and reached Karaveddy. Sumanthiran has a TNA-ITAK party office near the Mootha Vinayagar Pillaiyaar temple in central Karanavaai in Karaveddy. The ETIP then hung up another Sumanthiran effigy near the Mootha Vinaayagar temple with traitor placards. The gang then cut across via Kodikaamam road and then proceeded along the Kandy road through Chavakachcheri. The gang then reached the Northern province council complex at Kaithady along the A – 9 Highway and hung up a third effigy of Sumanthiran with the usual placards. The final phase was when Sathees and his gang reached Jaffna town. 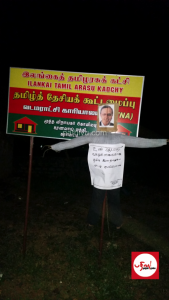 The ETIP went to the ITAK headquarters on Martyn road Jaffna and humg up a fourth effigy of Sumanthiran with placards. By this time it had dawned. Several people saw the gang putting up the effigy. The youths then told the people that they were members of the TNA youth wing and that they were hoisting the effigy as a warning to Sumanthiran who was a traitor to the Tamil people. 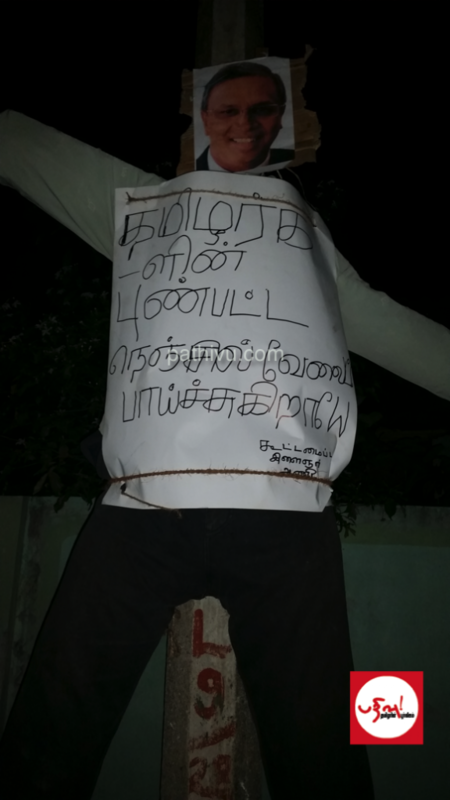 The hanging of four Sumanthiran effigies in one night was given wide publicity by tiger and pro-tiger media. It was portrayed as a spontaneous outburst of anger by the Tamil people over the allegedly treacherous conduct of Sumanthiran. It was depicted as an act undertaken simultaneously by different sets of people. The idea was to project an impression that Tamils all over Jaffna were opposing Sumanthiran. One overseas website stated that while the ITAK censured Ananthy Sasitharan over burning Sumanthiran’s effigy, the Tamil people had issued a death sentence on Sumanthiran and had “ executed him by hanging” in Jaffna. There was however a very commendable sequel.Instead of keeping away as his effigy hanging detractors wanted him to do, Sumanthiran along with Sreetharan MP participated in the Point Pedro discussion on the 4th evening as scheduled.In a show of solidarity two Northern provincial councillors and a Pradeshiya Sabha chairman were also present at the discussion. Some educated youths questioned Sumanthiran intensively within the parameters of the discussion about UN probe related matters. Sumanthiran answered them precisely. After the discussion ended the youths came up to Sumanthiran and thanked him for explaining the matter in detail to them. More discussions in similiar vein are being scheduled. Given the phenomenon of “Traitorization” in Tamil politics and the fact that extremist elements with financial backing from tiger elements in the Diaspora are involved in the campaign against Sumanthiran, there is no doubt that more such effigy exercises would continue in the future. Such acts will be described as manifestations of the people’s will by Diaspora elements though the Tamil people at large have not approved of them.It is important therefore for saner elements in the Tamil community to realise that “moderate”sections of the polity despite their shortcomings should be supported against the Tamil lunatic fringe. This writer has been severely critical of some actions by the TNAin the past and will continue to be so in the future too if necessary.There is however an imperative need at present to identify the comparatively moderate and sensible politicians of the TNA notwithstanding their flaws and support them in the struggle against the extremist lunatics in the Tamil community who have not learnt the lessons of Mullivaaikkaal and Nandhikkadal. The battered and shattered Tamil people are yet to recover from the ravages of conflict and war. It cannot afford to be plunged into chaos and despair again by those irrational elements pursuing a course of confrontation not only with the Sri Lankan state but also with India, the West and even the UN.This is the time to shed silence and speak out against those political extremists in Tamil society within Sri Lanka, Tamil Nadu and the Global Tamil Diaspora.